Here are the basics that everyone needs to know. So far, the focus is on knitting lessons but I have thrown in some crochet tutorials to spice things up. If you are so inclined, you can also go to my channel on YouTube, KweenBee Crafts, and see all of my how-to videos. 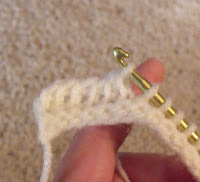 Scroll through the thumbnails along the bottom of the video player to find the knitting stitch you are looking for. Click the video and it will play on this page. If you no longer want to watch the video you selected, click the video again. To see the list of knitting videos again, click the PLAYLIST icon. It's the first icon on the bottom right. For a bit of extra help I've included some crochet techniques. I wasn't sure where else to link up to them so here they are. Your Youtube tutorials are great! I like seeing how you wrapped the yarn around your fingers in the first one. I've learned something new - thanks! Great tutorials ~ thank you!